A radiant 0.4 carat diamond ring from Le Vian. 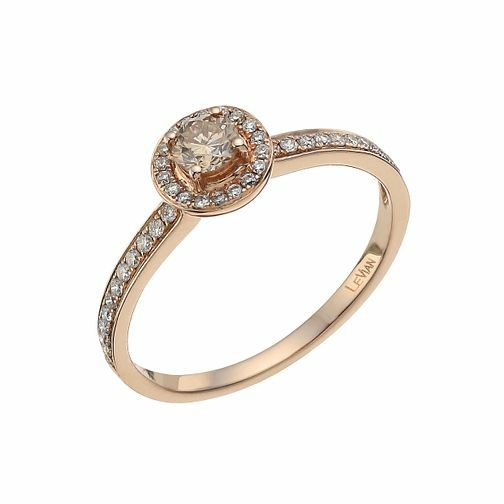 A Chocolate Diamond solitaire framed with glittering Vanilla Diamonds rests upon an elegant diamond set Strawberry Gold ring. Unique elegance from Le Vian. Matching Band: 9758852. Le Vian 14ct Strawberry Gold white & Chocolate Diamond ring is rated 5.0 out of 5 by 7. Rated 5 out of 5 by Anonymous from Gorgeous ring My husband got me this ring for our engagement and the matching wedding band, they look wonderful together and I have had so so many complements on how beautiful these rings are. Wouldn't hesitate to recommend, the quality is superb and I am still absolutely delighted with them a year on. Rated 5 out of 5 by Anonymous from Beautiful Ring This was purchased for me as an engagement ring. I can't explain how much I love it. It shines all the time and catches people's eye. Can't wait to get married so I can ware the matching wedding ring. Soooo happy.